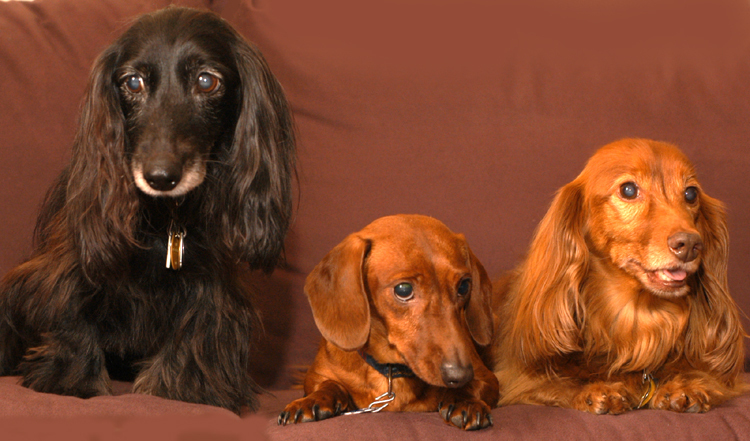 Because I'm bidding farewell to my webmaster duties, I'm taking this opportunity to publish a portrait of the three dachshunds with whom my wife and I have shared our home. You've seen them before, singly and in groups of two. But I just can't help showing them to you again. On the left is Ginger, our firstborn. She taught us humility and that no matter how many books you read about dog training, a smart dog will beat you at your game every time. In the middle is Clancy, our little blind boy. The last to arrive and the last to leave. When his brother and sister were gone from us, we gave him the task of filling our hearts. He did, then he left us much too soon. On the right is Fred. No dog has ever been more handsome or more loyal. Brian appeared on our Facebook page last month. Our Webmaster asked to publish his picture, because Brian resembles the Webmaster's late and much-loved boy, Fred. We granted this request – for reasons that will become clear next month. 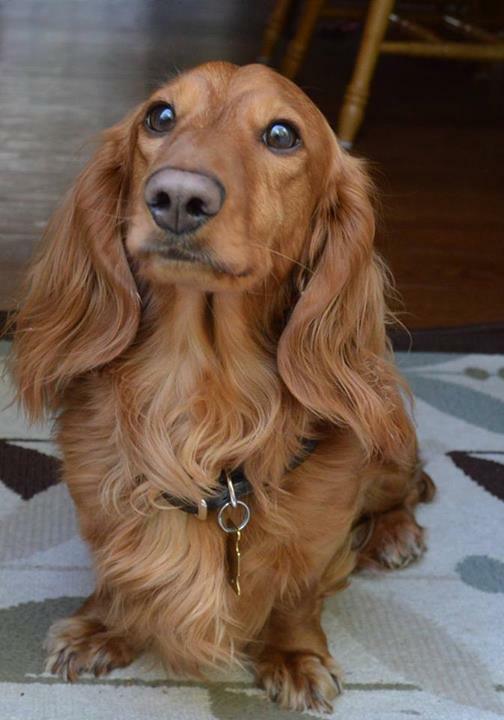 Six-year-old Desmond is a standard longhair who hails from Silsoe in England. 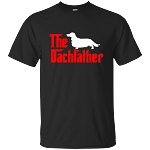 His owner, Brian H., says that Desmond is his ninth dachshund (eight of them rescues), and his first standard. When our friend and erstwhile Dachshund Delights team member, Shirley McFall, left Ohio to return to her roots in Southern California, she took her three dachshunds, Gracie, Sunnie and Dieter. The period from November 2012 to September 2013, however, was cruel. First Gracie, then Sunnie, made their exits. Dieter was left as a lonely only dog, a situation Shirley couldn't allow to continue. So early last month – just a few days after it was so cold that the pipes in the state capitol building froze and burst – Shirley and Dieter drove to Montana to claim one of the last pups from 2 Dogs Long. Young Phoebe greeted her new brother by running up and biting his ear, but Dieter (that's him in the background above, confident enough now to turn his back on his sister) is a patient and forbearing boy. Phoebe is now acclimating herself to her new home, where the Santa Ana winds on a recent day made the temperatures about 50 degrees higher than they were at her birthplace. If you've followed our site the last few years, Barb Techel's name will be familiar to you. She came to our attention through her book about Frankie the Walk 'N Roll Dog, confined to a wheelchair but never weak in spirit. We mourned when Frankie passed away shortly after retiring from touring schools with her never-give-up message. We cheered when Barb welcomed another special needs dog, Joie, then mourned again when Joie was taken away by disease earlier this year. The circle of life begins again, and Gidget has come into Barb's life from On My Way Home in Las Vegas. Gidget is an IVDD dog, but not confined to a wheelchair. What she shares with Frankie and Joie is a loving and loveable spirit. We wish her and Barb many years of happiness. Having a dog named Scarlett and having bid a tearful farewell to a dog named Katie, we could scarcely resist a dog named Scarlett Katie. That's her on the left, above, in the purple-accented harness dress, with her equally beautiful sister, Gracie Jewelanne beside her. 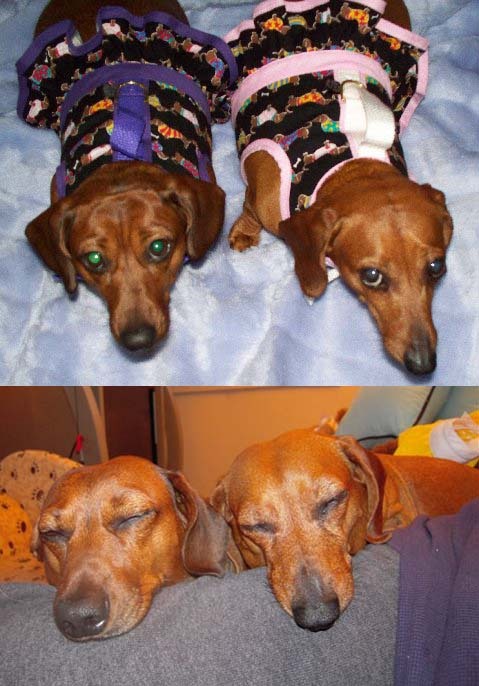 Their mom, Debbie, tells us that they love their harnesses. And we loved getting their photos. Last month, in our review of Barbara Behm's book Mr. Lincoln Goes To Washington, you met fictional dachshunds Dash, Longfellow, George Foreman and Lincoln. Now, meet their inspiration, Barbara's four hundish companions. On the left, you will see Longfellow. Rodney is in the middle. And those are Lily and Tomlin on the right.